Hyundai have revealed details of their new five door compact hatchback, the i30, prior to its launch in March this year. The new Hyundai i30 is designed to raise the bar on the standards of quality and handling set by the outgoing i30 models, which have been popular with drivers since their release in 2007. The aim of Hyundai’s designers is to boost the emotional appeal of the new i30, through its style and quality, as well as packing it with upgraded features. Hyundai are rightly proud of the achievement the new i30 represents, with the UK CEO describing it as a leap forward for design, build quality and refinement. You can choose from five petrol or diesel engines, with automatic or manual transmissions, including the 1.6 CRDi that comes with Hyundai’s latest clean Blue Drive and Stop & Go technology. This gives the engine the lowest emissions in its segment at 97g/km. Even on the higher output 128PS engine, Hyundai are keen to point out that their technology enables greater power without high emissions or fuel consumption. Hyundai are making the new i30 available for purchase in a choice of four trim levels: Classic, Active, Style and Style Nav. And while the Classic 1.4 litre 100PS is priced at a very reasonable £14,495 on the road, from its equipment level you might well think it was a more expensive car. As standard the new Hyundai i30 comes with voice-activated Bluetooth, a multi-function steering wheel, daytime running lights and electrically adjustable heated door mirrors. 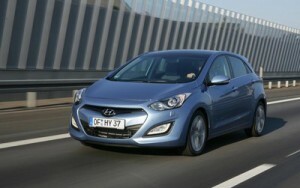 Plus Hyundai are generous with safety features, enhancing its appeal as a family car. All the new i30s have Vehicle Stability Management, Emergency Stop Signal and Hill-Start Assist. An upgrade to the Active range brings you cruise control, rear parking sensors, 15 inch alloys and Hyundai’s brand new FlexSteer (TM) system, allowing you to choose whether you want to set the steering setting to Comfort, Normal or Sport. The Style models step it up even further, with luxury touches like 16 inch alloys, automatic headlights, dual zone climate control and front parking sensors. Other features that make life easier include an automatic de-fog system for the windscreen, electrically folding door mirrors with LED indicators and rain sensing wipers. The top of the range Style Nav adds an inbuilt integrated touchscreen sat-nav system and a rear view parking camera, for ultimate driveability. The Hyundai i30 Style will be available for purchase, finance or lease with prices starting from only £16,595 on the road, while the range topping Hyundai i30 Style Nav 1.6 CRDi 110PS automatic comes in at £20,295. If you’re looking to purchase or lease a new Hyundai contact our sales team. Alternatively, visit our website where you will find new and used Hyundai available for sale or on finance.